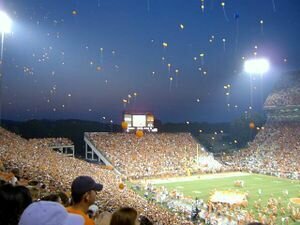 Memorial Stadium, also known as Death Valley, is Clemson University's football stadium. Construction began in 1942, originally seating approximately 20,000 , and today holds nearly 90,000 fans. It is one of the 10 largest on-campus stadiums in the country. The playing surface inside the stadium is known as Frank Howard Field, so designated in 1974. The original cedar wood seating was replaced by aluminum in 1972, some of which can now be found on the bar at the Esso Club. The stadium is currently undergoing renovations to add a new West End Zone which will house a Clemson museum, new locker rooms and training facilities, and luxury suites. The majority of the renovations are being funded by IPTAY. 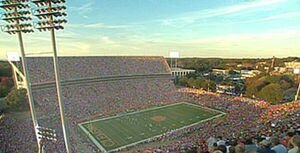 For the 2007 Clemson Football Season, the official seating capacity is 81,750. 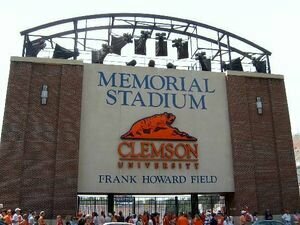 Memorial Stadium's popular nickname of "Death Valley" originated when Presbyterian Coach Lonnie McMillan observed in 1948 that taking his team to Clemson was like going into Death Valley. Coach Frank Howard began using the name regularly in the mid-1950s, and it stuck. This page was last modified on 9 March 2009, at 19:36.